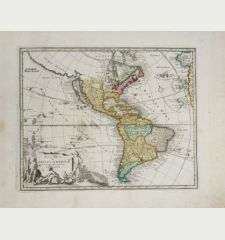 A matching set of two old colored maps of North and South America by Alexis Hubert Jaillot. California is still shown as an island and the Great Lakes are shown with open ends in the West. Separate running Latin titles appears above the neat line: America Septentrionalis in suas Praecipuas Partes Divisa, ad usum Serenissimi Burgundiae Ducis and America Meridionalis in suas Praecipuas Partes Accurate Divisa, ad usum Serenissimi Burgundiae Ducis. 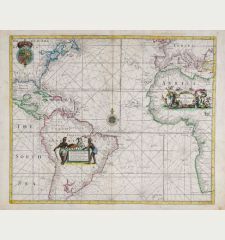 The map is based on the larger map of Jaillot of 1674 and was first published in his Atlas Royal in 1694. The copper plates passed to P. Mortier, but were never used by him. Around the year 1726 a second state appeared, after Ottens bought the Jaillot plates. This example corresponds to the third state with Chez R. & J. Ottens in the lower cartouche and appeared around the year 1729. 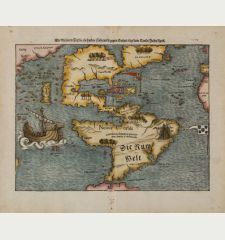 In later states the copper plates were updated and California is correctly represented as a peninsula, not as shown here as an island. 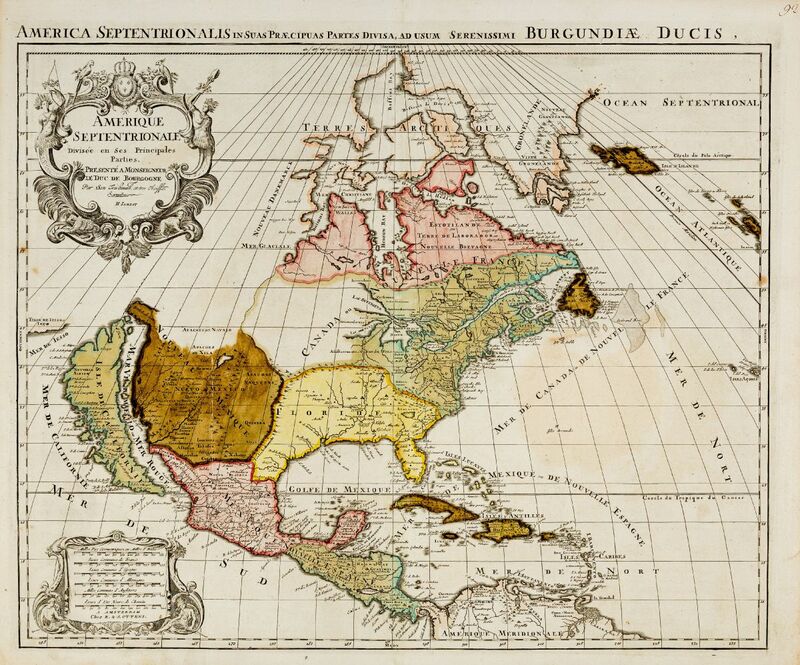 Title Amerique Septentrionale Divisee en Ses Principales Parties [and] L'Amerique Meridionale Divisee en Ses Principales Parties. Two small worm holes in upper title backed. Some minor browning in margins. Very good condition with original old colors. Hubert Jaillot, one of the most important French cartographers of the 17th century, was born 1632. He had a partnership with Nicolas Sanson's son and re-published and re-engraved many Sanson maps. 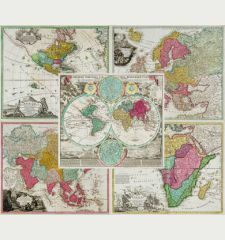 The Atlases and map mainly have been printed by Pierre Mortier in Amsterdam but also in Paris. He died 1712 in Paris. Alexis Hubert Jaillot: Amerique Septentrionale Divisee en Ses Principales Parties [and] L'Amerique Meridionale Divisee en Ses Principales Parties..